It is hard to believe we are at the 40th Annual Garlic Festival. We have been attending this festival for a very long time. Three years ago they have added a KCBS sanctioned bbq contest and we have been very happy attending and judging this stinking rose fueled event. We would like to share a couple of images with you. The weather was very pleasant with temperatures in the low 80's. 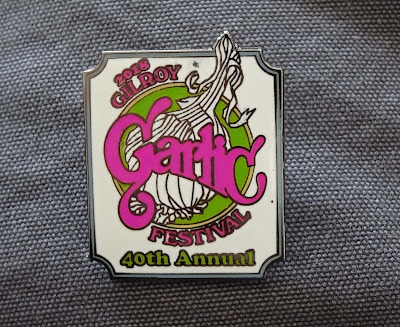 This festival has something for every garlic lover. Garlic ice cream? Yes. I have tried it in previous festivals and can attest it is sweet and garlicky. . 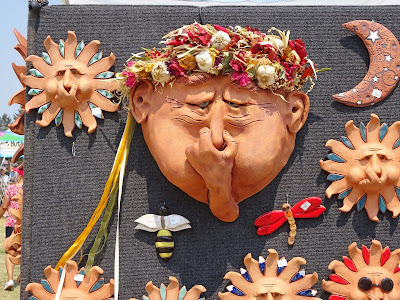 This craft vendor had the most fun ceramic hanging art pieces. There was a section that had lots of arts and crafts for the strolling garlic laced public. There was a tent that had nothing but garlic related food items such as mustard, olive oils, relishes and so much more. Garlic. Garlic. Garlic. Our good friends, the competition bbq team "Son of Smoke" which features Zack "The Kid" won Grand Championship today. Congratulations to all who competed. If you love garlic this is the festival you should not miss. We cannot wait till next year. I've seen the Gilroy Garlic Festival on TV and it looks like it would be a fun time. Big Dude, We have been attending since the 80's and took a break because it got so crowded. We have returned for the bbq contests and very happy to be back.